Apart from a couple of shades and Type A and Type B stamps to locate, this collection is complete and is set in ACSC order. Looking at your posts, I realize I have a lot of catching up to do. My old Scott catalog, which I have been using lately, doesn't even mention the QEII carmine-red A and B types. I just posted part 3 of the Elizabeth II pre-decimals. 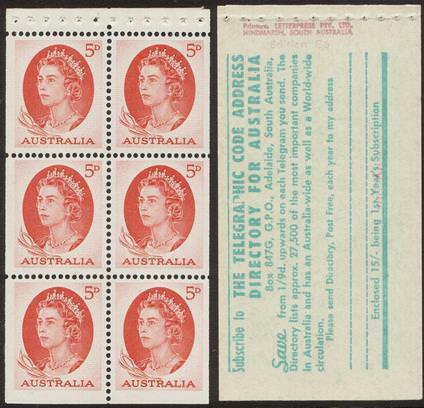 I believe the Scott catalogue (what I have seen of the book) is a simplified catalogue for Australian stamps and will not show many of the varieties in the QEII pre-decimal series. Next series to be posted will be the 1966 printings, many stamps of that era are duplicates of the pre-decimal era, such as most the birds and all the navigators. If you look at the pre-decimal navigators you will notice a £2 king with the specimen just below central position, that is a rare stamp and very seldom offered for sale. Also, the 1963 red 5d QEII 'Edition G6' non-Helicon block of 6 with cover is very rare, only about 4 booklets with the words 'Edition G6' printed on the cover are known to exist. There are normally two panes to a booklet, I have one pane plus the cover, the cover is the holy grail. If you look at the information below the stamps again, I added the reason why they are categorised "Type A" and "Type B".